Dhaka, Dec 16 (Just News): BNP Chairperson Begum Khaleda Zia on Saturday paid homage to the martyred freedom fighters who made the supreme sacrifice for the country during the Liberation War in 1971 by placing wreaths at the National Mausoleum in Savar, marking the 47th Victory Day. 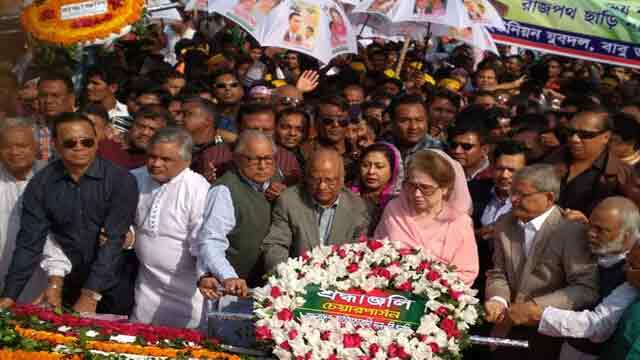 Khaleda Zia, flanked by her party senior leaders, placed wreaths at the memorial around 11am. BNP secretary general Mirza Fakhrul Islam Alamgir, senior joint secretary general party senior leaders Ruhul Kabir Rizvi, standing committee member Dr Abdul Moyeen Khan, and vice-chairman Amanullah Aman were, among others, present. Later, the BNP chief drove straight to the majar (grave) of BNP founder Ziaur Rahman at Sher-e-Banglanagar in the capital where she along with her party leaders and activists placed wreaths.